Have always struggled with getting perfect sabudana khichdi? If yes, then you are at the right place. I am sharing tips, the method on how to make Non-Sticky, BEST sabudana khichdi recipe. It is also known as sago khichdi. This is Gujarati or Maharashtrian style recipe that I grew up eating it. 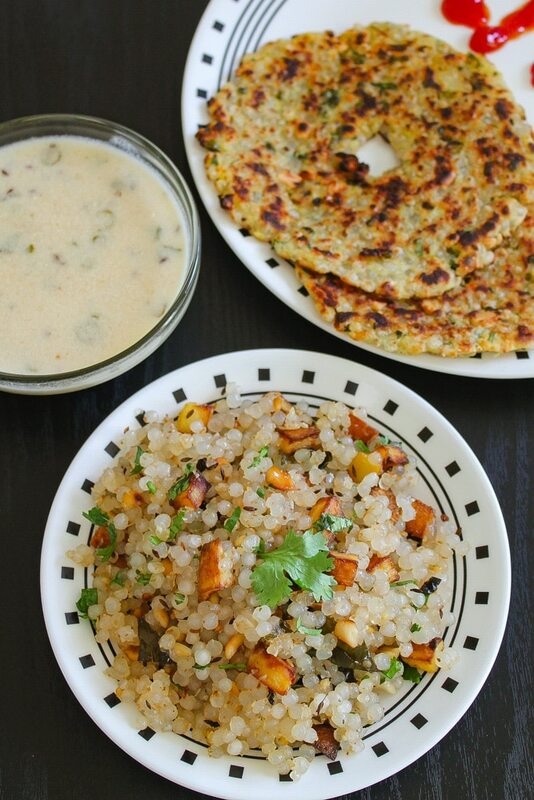 This sabudana khichdi is usually made during Hindu fast (vrat or upwas) like Navratri, Chaitra navratri, Mahashivratri, Krishna janmashtami, Ekadashi, Gauri vrat or Jaya parvati vrat. There are no hard rules, you can make it and enjoy it any time of the year. It doesn’t have to be fasting days. 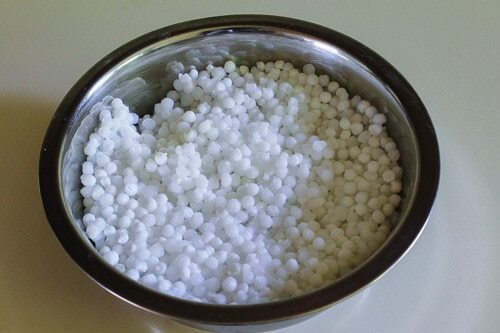 How to soak sabudana for khichdi? Wash the sabudana under running cold water till water runs clear. Or rinse them really well till water is not cloudy anymore. Soak in water for 2 hours to overnight (depending on your sabudana quality and type). Use a wide, shallow bowl and add only enough water that pearls are just submerged in water (about 1 ½ inch of water above the pearls) If soaked in more water then it will be gooey, sticky mess. 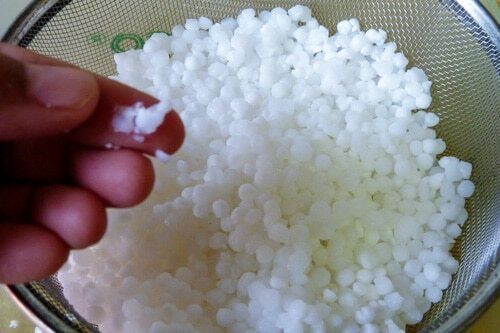 After the soaking time, tapioca pearls will swell up almost all the water and there will be hardly any water left. They become almost triple in size. Transfer the soaked sabudana in a colander and let the excess water drain for 10-15 minutes. How to check sabudana is soaked properly and ready for cooking? When you press one soaked pearl between your finger and thumb, it should mash very easily without any effort. How long to soak sabudana? There are so many different varieties of sabudana available in the market. Some require 2-3 hours soaking and some require 8 hours of soaking. Sabudana soaking time depends on the quality and type of sabudana. So experiment with your sabudana and decide the soaking time. Mine needed overnight soaking. Can I soak sabudana quickly or instantly? No, you cannot soak sabudana instantly or quickly. So always plan ahead of time. 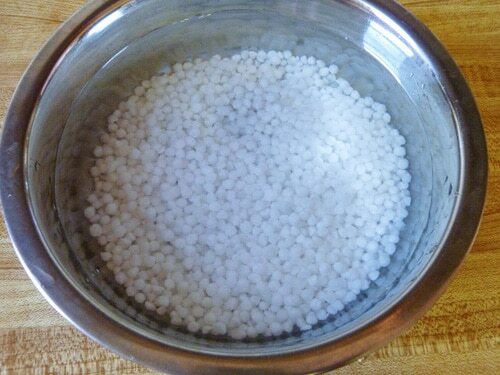 Once the sabudana is soaked, drain the excess water and store in airtight container in the refrigerator. It stays good for 3-4 days in refrigerator. Can I cook sabudana khichdi without soaking? No, sabudana khichdi cannot be made without soaking sabudana. You must soak them till they are soft and plumped. It is important to get rid of all the starch by washing, rinsing pearls properly. It is very crucial to soak sabudana properly. So follow the above-mentioned method, notes to get it right. Even if you feel there is no water left after soaking, Still keep them in a colander to drain. You will get about 1-2 tablespoons of drained water. Do not stir too much while cooking otherwise pearls will stick to each other becomes a clumpy mess. Just toss or stir till everything is combined. Do not overcook them, otherwise, pearls become chewy. Then add chopped green chilies and curry leaves. Saute for 30 seconds. Then add cubed potatoes and sendha namak. Mix well. Mine are crispy and browned because I used wide pan and potatoes are in a single layer. If using kadai (wok) or potatoes are overcrowded then they will be soft. Either way tastes good, it’s all about preference. Once potatoes are cooked, add crushed peanuts and coconut. Mix well and cook for 1-2 minute. Then add soaked-drained sabudana. If sabudana are drained properly, they will stay separated. Otherwise they will stick to each other. And cook for 4-5 minutes till sabudana pearls are soft and transparent. Make sure to stir, so it doesn’t stick to the bottom of the pan. If you overcook the sabudana then it will become chewy and will stick to each other and make a big clump. Mix well and garnish it with chopped cilantro. 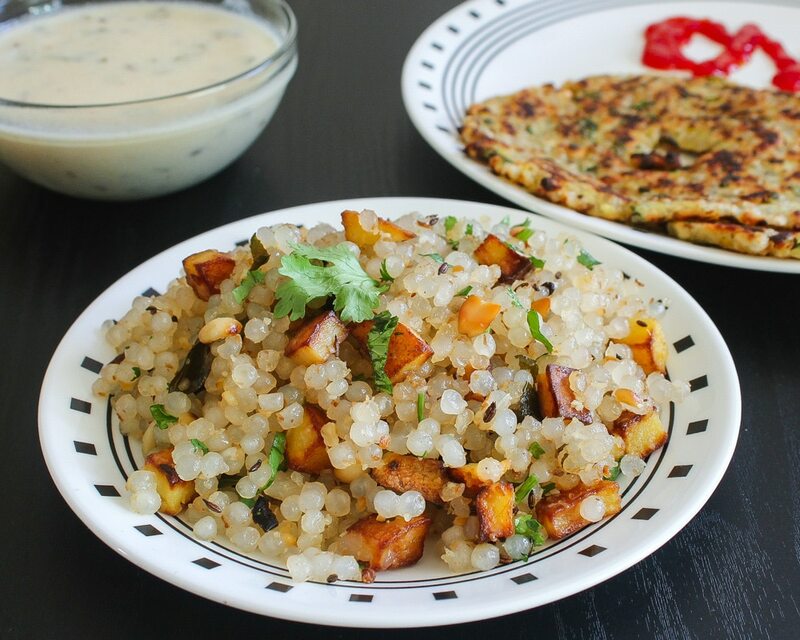 Serving suggestion: Serve sabudana khichdi as such as a breakfast or snack. I have served this with rajgira kadhi. And this combination is unbelievably awesome. If you haven’t tried then I strongly recommend this combo. Do try and let me know how you like it. 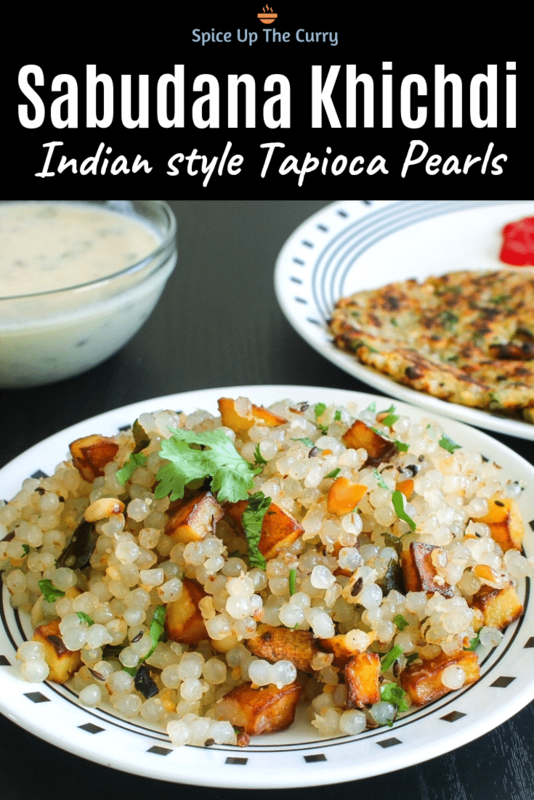 Sabudana khichdi recipe for vrat, Hindu fast – Tapioca pearls are cooked with potatoes and crushed peanuts. 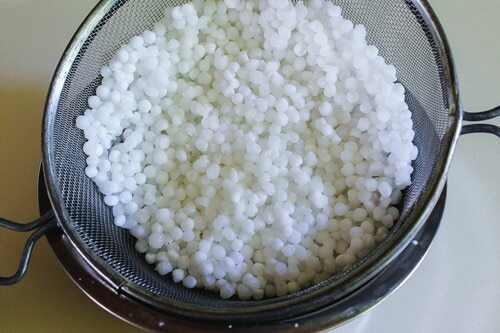 Take pearls in shallow, wide bowl, add only water so pearls are submerged in the water and soak for 2-3 hours to overnight. Then transfer to a colander and let the excess water drain for at least 10-15 minutes. Heat the oil in a pan on medium heat, once hot add cumin seeds and let them sizzle. Then saute chopped green chilies and curry leaves for 30 seconds. Then mix in cubed potatoes and sendha salt. Cover the pan and cook till potatoes are soft and cooked. Then add crushed peanuts and coconut. Mix and cook for 1-2 minute. Then add drained sabudana and mix gently. Do not stir or mix too much otherwise, it will end up in a lumpy, sticky mess. And cook for 4-5 minutes till sabudana pearls are soft and transparent. 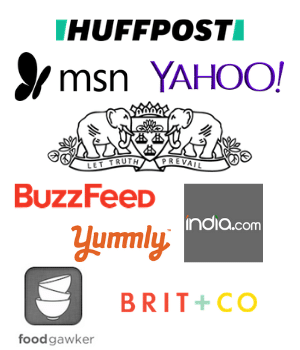 I have mentioned all the tips to avoid stickiness. Yes there are many different kind and based on type and quality soaking time varies.